Since we’re at the halfway mark of the season, it’s probably time for me to assess the season so far. I doubt if many regular readers will be surprised to hear that I’m disappointed. The casting has been awful. Besides a group of returnees I never needed to see again (especially Nicole), the “noobs” are even worse. 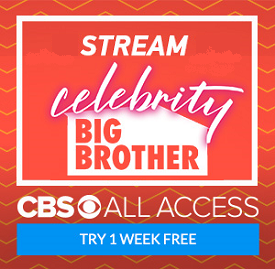 Paul, Michelle, Victor, Zakiyah, and Bridgette are among the worst people every cast for this show, and Paulie’s arrogance makes me hate my gender every time I hear him open his mouth. What’s most disappointing is this season’s female half of the house. In a year when women are actively fighting back against online misogyny, and we actually have a female candidate for President, these twits take the women’s movement back at least a decade. Nicole and Zakiyah care more about their boy toys than actually playing the game, and Michelle’s constant tears and jealousy indicates to me that she longs for her own version of Corey or Paulie. It’s a sad state of affairs when we see Nicole constantly run up to inform the boys the latest things her female “friends” have said. With that in mind, you can probably imagine that I’m not really excited for tonight’s episode. It’s still the Paul show. Well, really it’s the Paulie show with Paul wearing what’s actually a symbolic HOH necklace. It’s pathetic, and nothing happens tonight that gives any hope for tomorrow. 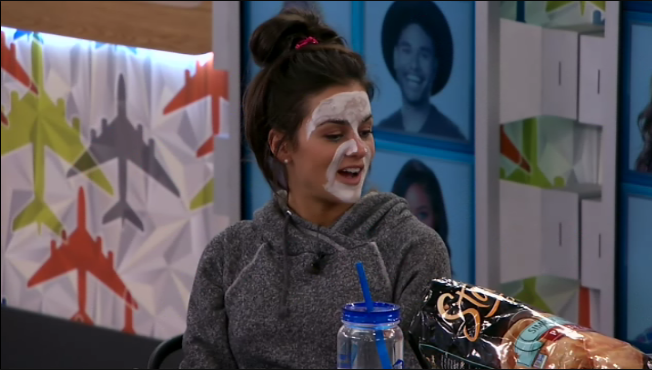 But I’m your trusty recapper, so I’m still here to jump right into the reaction of Paulie...I mean Paul’s nominations of Bridgette and Paulie. Paul still wants Bridgette gone, but is fine with swapping out Paulie for Day after POV. Bridgette calls her nomination a “slap in the face”. Whatever. Day is surprised by the nominations because Nicole was supposed to be the pawn. “I don’t like being out of the loop.” Paulie pretends to be pissed and then giggles. Bridgette and Day are now alone in the kitchen, so Day uses the opportunity to talk about Nicole. 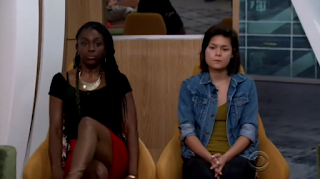 “You gotta try to win that veto”, she says. Bridgette isn’t really buying it as she doesn’t trust Day. Bridgette then heads up to the HOH, and Paul apologizes for his HOH speech. He tells her that Day is dangerous and if she wins POV then Day will go up in her place. Secretly, though, Paul still wants Bridgette gone. He tells her to “lay low and let other people be targets”. She promises to make him some cookies. Outside, the bro’s all get into the hot tub. “There’s a whole bunch of manjuice”, says Paulie. Nicole comes out and babbles about dreaming about Derrick. Gross. Ugh, and Cody was also in her dream. This is terrible. Back in the house, Natalie has a face mask on and says she wants to play in the POV. Paulie then talks about how he’s going to sleep in the POV, and this doesn’t please Zakiyah. “For some reason lately, he’s been acting pretty distant.” Up in the HOH, Zakiyah then tells him that she’s going to sleep downstairs. “That’s what I already said”, he replied. She’s become too needy (you think? ), and he talks about that with Paul. Back downstairs, Zakiyah says “I swear I don’t like him anymore”. She doesn’t deal well with attitudes, and Michelle just agrees with everything she says. In the HOH, Zakiyah says he deals with women, not girls. Zakiyah starts crying, and the sad violins start up. As we go back and forth, we hear Paulie even says he’s ready to nominate her in the near future. This problem between the two can’t go on, so Zakiyah heads upstairs. Unfortunately, the two bro’s are asleep so she sprints back downstairs. Paulie has awakened, though, so he heads down to “put out a fire tonight”. 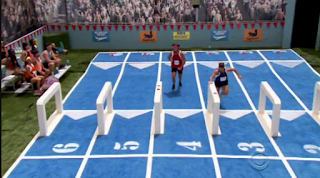 (BTW, we played all of this on last week’s Big Brother Gossip Show.) As always, he’s pretty condescending to her as they argue. He finally leaves the room because “I don’t deal with drama inside the house or out”. What a douche. After commercials, it’s filler time!!! Paul sprays shaving cream in Michelle’s beverage, and she runs after him screaming. She gargles, and then throws an apple at him. “Did that hurt?” It did. It even left a mark. He’s fine with it, but stupid Michelle starts bawling. In and out of the diary room. This is tough to watch. Ok, it’s time to pick POV players. Paul picks the first chip, and it’s Corey. Paulie grabs Houseguest choice, and he asks if Victor wants to play. He does. Bridgette nabs Natalie’s chip. Paul and Paulie pretend to play chess while they actually talk about putting up Day. Guess who joins them? Yep, Day. She wants to know what plan B is, as she’s hoping that it’s Nicole. “Sketch”, says Paul. Paulie then informs Nicole and Corey about this conversations, and Nicole now wants to get Day, too. He adds that if he wins HOH next week, he may put up Z. He’s tired of the drama, as he’s “focusing on the competition”. He needs that smile back on his face. Gross. Of course, Nicole loves every second of any conversation that talks about eliminating any other women. After adverts, it’s POV time. It’s a track meet setup, and there are five “races”. It’s that old “ready set go” comp. When the screen says “go” they are to race to the other side, and there are dummy words to mess them up. 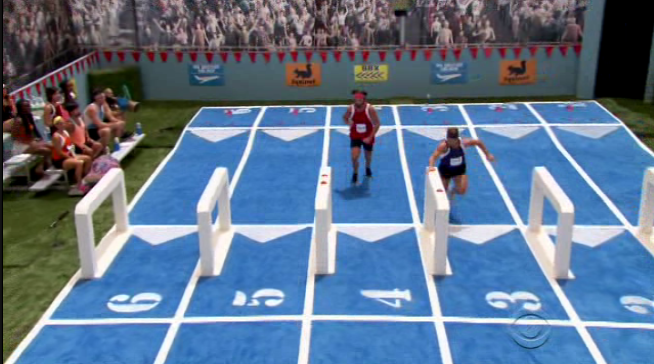 Of course, right after bragging about his college track days Corey has a false start to be eliminated. Dummy. My god, the diary room commentary is beyond terrible. Bridgette is in last place for the second heat (aka first real race). Natalie is already “super tired”, so it’s lucky for her that she’s out in the next round. Paul is the next to be eliminated, so it’s between Victor and Paulie for the POV. Yep, Paulie wins. With that idiocy over, Zakiyah tentatively heads over to Paulie and hugs him. In the storage room, Paul tells Bridgette that Paulie will probably take himself off the block and she should pretend to hate him. The Day plan is still in effect, but Bridgette doesn’t know whether to believe him. When Paul leaves, Day enters and asks about Plan B. 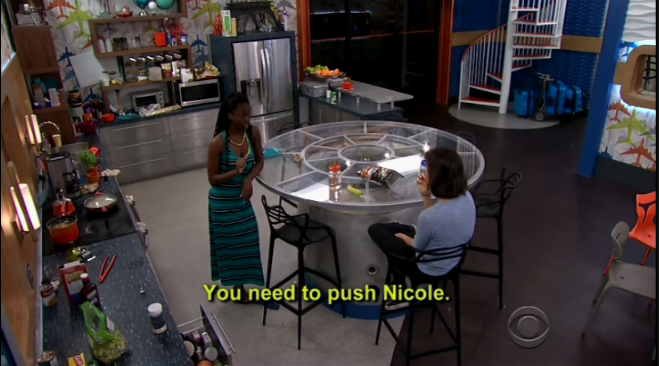 She doesn’t know, but Day still wants Nicole out. (So do I.) “Everybody is suspicious of her”, she says, but Bridgette doesn’t really want to hear it. The lovebirds are now reunited. She asks him how things are going to play out this week, and he lets her know that Day is probably going to replace him on the block. “I feel really bad. I really like Day.” Zakiyah still believes that it will be Bridgette who goes. Paulie then asks who should go next, and she says Paul. Oh you silly little twit. “This concerns me”, he says. Now he needs to let Paul know about this. 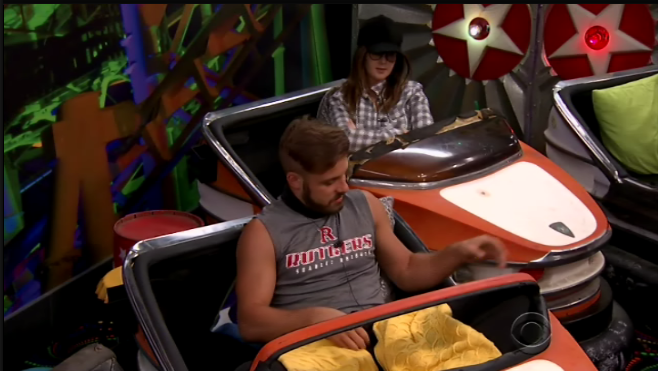 Shortly before the POV ceremony, Day visits Paul in the HOH. He lets her know that Paulie is going to pull himself down, and he thinks she’d be the best replacements because she wouldn’t freak out. Day doesn’t get it. She thinks it should be Nicole, who volunteered to go up earlier, or Natalie. 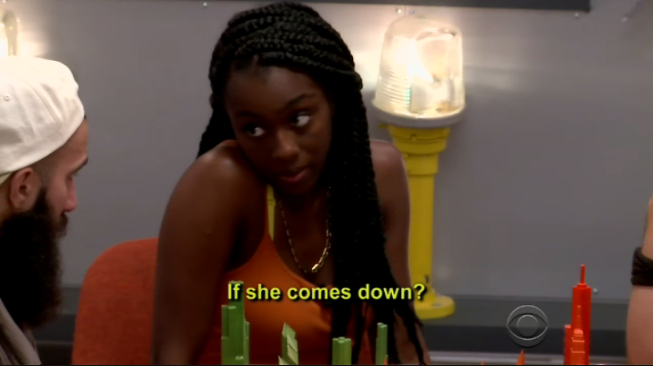 Paul claims he hasn’t make a decision yet, and Day says she’s a “pretty big target” if she’s put up on the block. Paul says that he thinks they have a good bond and trust with her. She’s not that stupid, Paul. The hour is almost finally up, which means it’s time for the POV ceremony. As you may expect, Paulie saves himself and Paul puts up Da’Vonne as his replacement because she’s “confident” and “calm”. Um, sure. There’s some meaningless babble as we head to the end of the episode, and that’s it. What are your thoughts? Is there anything likable about this season? Would you rather Bridgette or Day go home tomorrow? And would you like to slap Paul, Paulie, and/or Victor in the face? Chat it up, folks!!! I agree, Scott. The only show I regularly watch is Thursday. I'm very sporadic regarding the other nights. I don't really watch BBAD any longer either. It's making me think about if I really want to watch the autumn show. I'm wondering what the show would be like if it featured some mature, intelligent people who have some life experience. I don't give a crap about the eye candy thing in any way. Get some players who have some brains and human voices. Make the comps be more brains and less running around and jumping up and down. They could hire monkeys and they'd be more interesting than this bunch of pimple pickers. I wish that CBS would have including one line during the Paulie/Zakiyah argument and that would be when Zakiyah tells Paulie that she hadn't done anything petty "today." I thought that was hilarious. For people not watching the feeds or listening to your podcast, they might be unaware of how jealous Z is about EVERYTHING, so they could have shown the hair petting debacle. By the end of it, I felt so bad for Z. The way Paulie was speaking to her was practically verbal/emotional abuse. It's disgusting. Btw, is it just me or has anyone else noticed that Michelle goes from not crying to straight up sobbing with no buildup? Also, when did they switch back to the nominees being able to pull names from the box for POV players? At the beginning they changed it to the HOH pulling the chips, but now it's back to normal. That was changed simply due to the fact that they went from 3 noms to 2. Having 3 meant only 2 others were playing POV so they couldn't have each pull a chip. Oh, okay. That makes sense, thanks. James and Nicole discuss giving each other money.